Gehan Homes is now open in the highly anticipated community of Stonegate, a new 206-home residential community located in Irving, TX at the northwest corner of Highway 114 and Belt Line. The community was self-developed by Gehan Homes and the purchase represents the company’s desire to continue to diversify its product offering and increase market share. The move is demonstrative of the homebuilder’s aggressive investment in land and lots across Texas and Arizona. “The Stonegate development is a further indication of our commitment to the DFW market as well as expanding our presence in all five markets. Since transitioning to a wholly owned subsidiary of Sumitomo Forestry of America two years ago; we have systematically increased our investment across all platforms. We look forward to gaining market share as the cycle continues to mature; driven by increased focus on acquisition combined with recent product diversification,” said John Winniford, CEO of Gehan Homes. Six all new floor plans are available ranging from 2400 SF to over 3750 SF. Interested buyers are invited to visit the model home located at 7679 Picton Drive, Irving, Texas, 75063. Gehan Homes, headquartered in Dallas, Texas, has been building beautiful homes at an exceptional value for over 25 years. 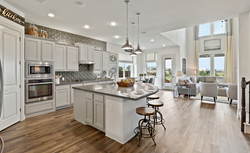 Known for their award-winning designs, quality craftsmanship, smarter floor plans and competitive pricing, Gehan Homes is the 14th largest private homebuilder and the 32nd largest homebuilder in the US. Gehan Homes has offices in Dallas, Houston, Austin, San Antonio, Texas and Scottsdale, Arizona. For more information, visit gehanhomes.com.